Artificial sweeteners have been around for more than 100 years but it has only been in the past few decades that they have really taken off and become a large part of our diet. Artificial Sweeteners are man made chemicals. They cannot be found in nature. They do not contain nutrients for your body like essential vitamins and minerals and they really don't contain much in the way of calories. Pretty much they are made just to give the sweet flavor of sugar without the side effects of sugar. And really they do a pretty good job at doing just that. However, they also bring with them a whole new set of problems that I would consider to be worse then those associated with sugar. They are man made toxic chemicals that your body was never intended to use. And if you are older like me, you might remember those commercials that used to say - "It's not nice to mess with Mother Nature"
The history of artificial sweetener development seems to follow a very similar and disturbing cycle. Each time a new sweetener has come to the market as the new diet savior it did so in much the same way. The pattern seems to start with one or more scientists researching a totally unrelated field of chemicals when it is accidentally discovered that the chemicals taste sweet. A manufacturing company takes the newly found chemical and does enough of the "right testing" to show that it is safe and convince the authorities such as the FDA that what they say is true. The testing, however, is actually quite often inadequate to actually prove this and rarely if ever is done over a long term. Marketing and Advertising campaigns sing the praises of this new savior for all those who are overweight and those wanted to have sweets but don't want the evils of sugar. Food production companies race to add this amazing new chemical to their products so as to not miss the bandwagon. With all the media exposure and slick advertising, the public jumps in and the sales for the new sweetener increase dramatically. But after some time the complaints and illnesses begin to show up. Side effects of the chemical that are now being seen in more and more people create the need for more studies to be done. True health risks are discovered and the sweetener falls out of favor with the public and the food manufacturers. Aspartame was first discovered in 1965. It is better known to most people as NutraSweet or Equal (the little blue packet). This was the big diet food savior during the last part of the 20th century. But the many complaints and side effects that followed aspartame gave rise to the latest artificial sweetener... Splenda. 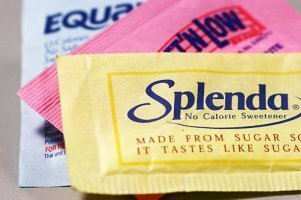 Splenda, the brand name for the artificial sweetener sucralose, began to show up in the late 1990's. It showed up just in time to save us from the evils of aspartame and during the start of this century had a meteoric rise to the top of the sweetener wars. These are just the latest of the artificial sweeteners to hit the market. They certainly are not the only ones and with the amount of money people spend on diet products and low cal foods they certainly won't be the last. There are, however, quite a few other artificial sweeteners out there including cyclamate, alitame, acesulfame-K, and neotame. The chemical makeup of each sweetener is a little different so they all have their own harmful side effects but overall the big problem that they all share is that artificial sweeteners are all derived from dangerous chemical compounds. For example, saccharin was discovered accidentally while researching toluene derivatives. Toluene is a liquid produced during the process of making gas from crude oil and it is registered as a hazardous chemical. Sucralose was discovered while researching new insecticides. During an experiment with sulfuryl chloride, a known poisonous chemical, the research assistant thought the boss said taste it instead of test it and guess what it was sweet. But the problem was the powder that was created contained a lot of chlorine - DDT is very similar in it's number of chlorine atoms. Another problem with these sweeteners is how they react within our body. Aspartame is metabolized and breaks down into things such as methanol which can cause definite health problems. Overall these sweeteners have not been tested thoroughly. The research that has been done is often flawed or has had the statistics twisted in order to push the products through the FDA. They all come from chemicals and chemical compounds that are KNOWN to be hazardous. We are doing a great big science experiment with the human population as test subjects. And while preliminary results are in with many health complaints, the final result is unknown. Do you really want to be a guinea pig or research rat? Why put hazardous chemicals in your food just because they taste good? Don't wait until your 50 or 60 years old with debilitating chronic disease to find out that these products really are harmful. My advice is to avoid all artificial sweeteners whenever you can!